Being a silent movie adherent was like donning a dunce cap in early 50's Hollywood. Anyone proposing commercial life for non-talkers, outside a Chaplin, was for birds, or unemployment lines. Robert Youngson proved adept enough with novelty shorts at Warners to sneak by single-reel sampling of once done up big, but since discarded, relics. His were like Castle Film highlights from Don Juan, Old San Francisco, Isle Of Lost Ships, and one RY particularly liked, Noah's Ark. A super-spectacle this was, with everything but dialogue (there were chat passages, awkwardly done, and no way useful for latter play). This all put brakes on reissue chance. WB could bank on Little Caesar and Public Enemy for 1954 dates, both nearly old as Noah's Ark, but at least these talked throughout. Silents were for scrap-heaps, or fattening libraries sold by mid-50's to voracious TV. Warners made their vid deal for whole of its pre-49 library, including what voiceless flickers survived. Receiving Associated Artists Productions sought value, however slight, that might derive of least desirable among WB's fabled stock, screening vaulties toward possibility, however remote, of peddling same to art and specialty houses. AAP came to meeting of minds with no-longer Warners employed Youngson over the one pearl he'd championed, Noah's Ark, which had the Bible for story origin, just like mega-smash The Ten Commandments, then on roadshow march. Could Noah's Ark get by being old, so long as it was Old Testament? Every theatre in the country wanted The Ten Commandments in mid-1957, but most couldn't get it, DeMille's spectacular having pitched tent among biggest houses and staying for what promised forever. 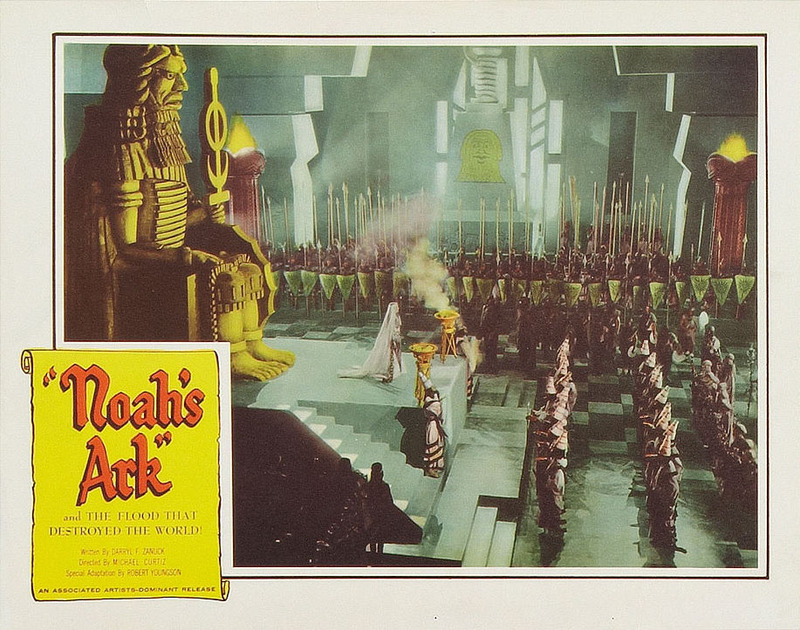 AAP figured Noah might pinch hit for audiences waiting on Moses, and they had subsidiary Dominant Pictures to handle distribution, latter's purpose to eke out the last buck from theatres before they (the Warner titles) were shown on television, according to Variety. Noah's Ark would be an experiment, said the company, to see if extreme oldies might sell. To hedge bets, AAP and Youngson cut the 1929 release nearly in half and laid over music and narration. Dominant would treat Noah's Ark like a new picture, saturation booking it through the country one area at a time, according to Variety. One hundred dates for late July and August 1957 were set in tri-states Pennsylvania, New Jersey, and Delaware. Full-page ads went into Philadelphia newspapers, but none disclosed Noah's Ark being a silent made decades before, ID'ing it instead as simply The Most Spectacular Picture Of All Time. 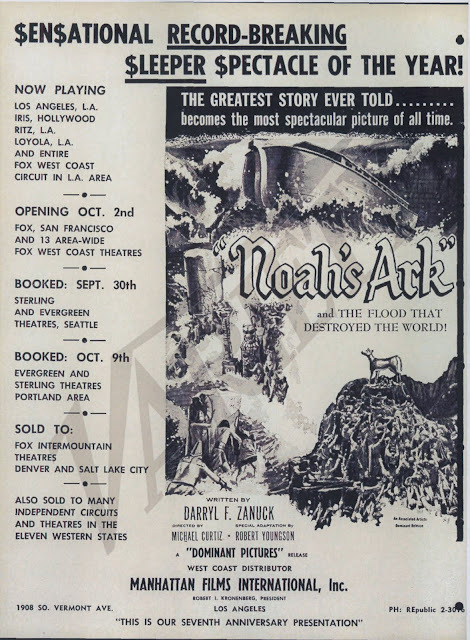 Ten of the first thirty theatres held over Noah's Ark for seven-day runs, better than what Dominant anticipated. With floods, spearing, and columns falling, this was no art-house cast-off. Showmen could bally Noah to hilts as next-best Ten Commandments, so long as Paramount's biggie eluded them (our Liberty wouldn't get TC until September 19, 1957). Dominant had offices mostly on the east coast, so arrangement was made with Manhattan Films International to handle Noah's Ark in eleven western states, Alaska, and Hawaii. Aggressive Manhattan got the film into LA just as The Ten Commandments wrapped forty-six weeks playing first-run, timing just right for another biblical, whatever its vintage. Response to Noah's Ark was mixed overall, depending on territory and how it was pushed. Baltimore saw torrid biz at its Little Art Theatre, wherein records were beat, but faces turned red when St. Paul, Minnesota patrons, lured by Bigger Than Biggest ads, found to chagrin that this was an epic sans talk. More than a few moviegoers attending it became so upset when they learned the truth that they jumped up and demanded their money back, said the St. Paul Dispatch's movie columnist. They'd thought Noah's Ark was a brand new epic that somehow was made with no publicity. Still, despite refunds, the show performed above average for Minneapolis-St. Paul houses, and certainly beat typical revenues for a reissue, even if Noah's Ark wasn't necessarily revealed as such. Small towns reveled in Noah's Ark, Biblical themes always welcome in Southeast climes. That collecting Moses who guided me to promised land of 16 and 35mm acquisition, Moon Mullins, was handed an exchange-discarded Noah and ran same to his movie club during the early seventies. 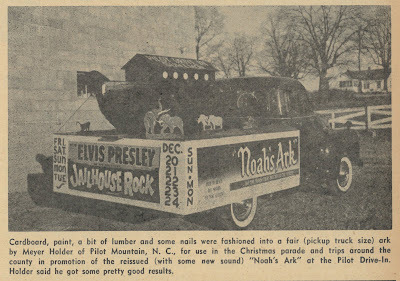 A Pilot Mountain, NC showman (right) got Noah's Ark into the town's Christmas 1958 parade to some pretty good results, said Boxoffice. 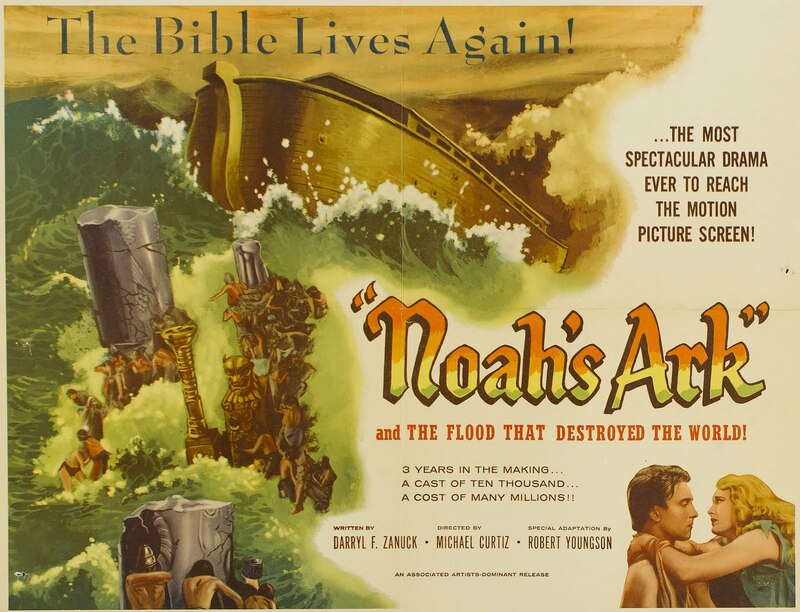 Well, it's not as though there were other Noah and the Flood pics to compete with. Perhaps realizing this, the Mirisch Company announced in July 1958 intention to make a new and multi-million $ Noah's Ark (didn't happen). The original meanwhile floated through circuits starved for product. 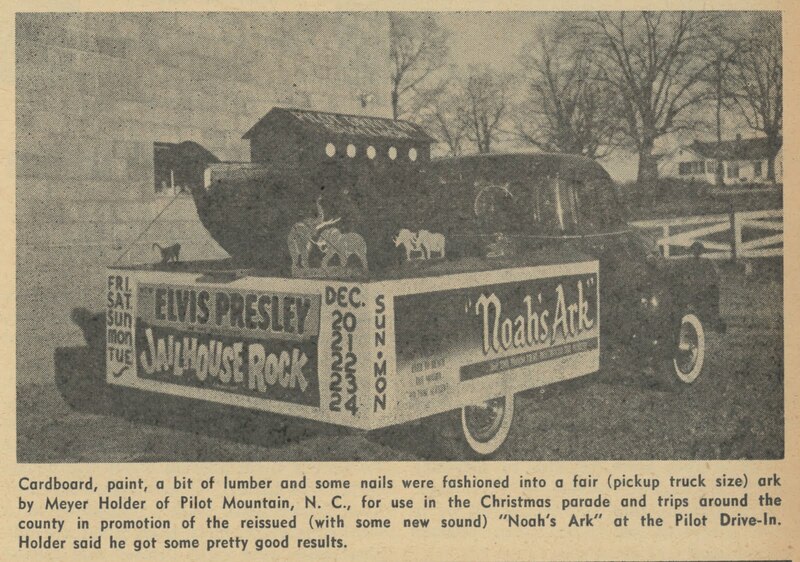 Part of why reissues boomed was lack of small or B titles to fill in weeks, thus Noah's Ark was back in Los Angeles in September 1958, this time with AAP/Dominant's Yankee Doodle Dandy, another Warner fave withheld so far from TV. The duo saw but a mild $4,500 and was gone in a week. AAP had entertained possibility of reviving WB silents beyond Noah's Ark, with maybe a festival group for art-houses ... that announcement came to nothing. 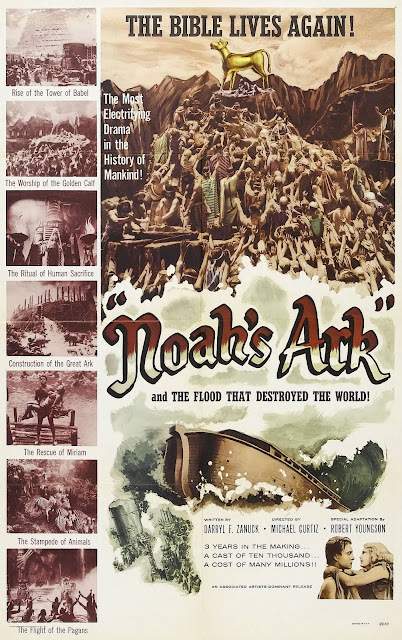 Of all pre-talkers they now owned, it appears AAP and successor United Artists included only Noah's Ark among features syndicated to TV (Noah became available for broadcast in the mid-sixties). Back in ownership Warners recently did right by venerable Noah's Ark by issuing a complete-as-exists 1928 version, this a first time the McCoy has been available on video. It's a solid DVD well worth having, though bittersweet is disapperance of Robert Youngson's revamped version. Will that ever surface on TCM or disc? More Noah's Ark at Greenbriar Archive. In my earliest collecting days, I stumbled onto a handful of 8x10's from the re-issue (wish I had 'em today!) This was around 1970... I was just a kid, but I knew this was a '28 silent, could figure out it was some sort of late fifties re-release, I just couldn't dope out why all the glossies were extreme wide shots, no close-ups of the actors at all! Disguises...like what MGM did with THE MAN FROM U.N.C.L.E. paste-up features. In iddy-biddy type on the one-sheets, one could barely read "Adapted from the NBC TV series." Anyone out there in internet land ever seen any of the WILD BILL HICKOK paste-up features released to theatres circa 1952-53. TWO GUN MARSHAL, THE YELLOW-HAIRED KID, BORDER CITY RUSTLERS are but a few. These things ran only around 50-54 minutes because they used only two episodes to make a feature, instead of three. 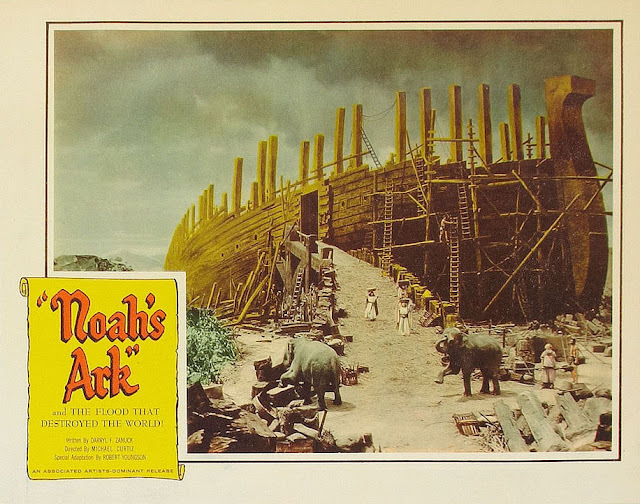 "Noah's Ark" is one of those not-necessarily great movies that I enjoyed more than a lot of alleged classics. I watched it only once, maybe four years ago, and haven't forgotten it. Gotta dig it out again soon. Disguised marketing can be pretty funny. Disney's "So Dear to My Heart" is about a farmboy who raises a black lamb and enters it at the fair. Posters for the film focused on a little girl (a secondary character) and a horse (a literal walk-on), as if this were a countrified "National Velvet." Evidently a sentimental image of a boy and his sheep didn't test well, or tested well with the wrong demographic. Saw Noah's Ark one time on tv along with the silent Ben Hur on a Christmas Eve silent special appropriately called "Silent Night" around 1990 on either TCM or TMC?? I would love to see the orig. '28 "Noah" -- never saw it in any form. I love how the re-issue ads go out of their way to play-up Darryl Zanuck's participation, while eliminating any reference to either George O'Brien or Dolores Costello. 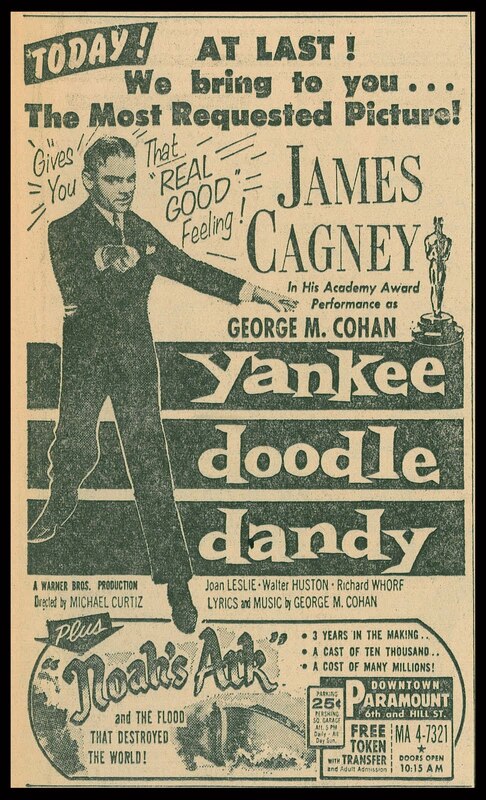 By the way, were you aware that my grandfather and Jack Scholl both made a sizable, albeit uncredited contribution to "Yankee Doodle"? (I don't think Dad mentions this in his book). They composed the entire race-track scene, "Good Luck Johnny" as well as "All Aboard For Old Broadway", but could not be credited because of a contractual obligation the studio had with George M.
And, ironically, both M.K. and Jack wrote an extra song for Dooley Wilson to do in "Casablanca"(ultimately cut), called "Dat's What Noah Done". Doubtful if it was inspired by Warners earlier hybrid-talkie, though. Any word on what that "Special Adaptation" credit for Youngson entailed? A simple cut for length or a re-cut? New titles? You don't say, but I'm assuming the new prints had a music/effects track? MDG, Youngson really earned his "Noah" credit, as he recut, wrote narration, and arranged a new score ... near a total reconstruction of the film. RJ, great stuff as always from you. Now I'm curious to hear "Dat's What Noah Done". Just one thing - that picture of George O'Brien cradling some dame is NOT from Noah's Ark. If you look at it closely it is obviously a costume party scene - there are women in high heels and a man in 18th century dress behind them. Also O'Brien is not as muscular at this time as he was to be later in the 1920s. I'm not sure what movie this is from, but certainly not Noah's Ark! Some of us George O'Brien fans have speculated it might be Shadows of Paris (1924) which includes scenes of high life in Paris - but since it is a missing film - who knows? Your curosity on "Noah" is as close as your contact to Amazon (I'm assuming). Turner and Rhino Records issued it a few years back on a "Casablanca" compact-disk, along with other musical tracks from the film, plus an expanded version of "Knock On Wood", with an 8-bar bridge that again was cut from the final version. (I often wondered why there was no bridge on that!) Think you'll like and find interesting.